With Physiotec, you have access to your home exercise programs online through your smart phone, electronic tablet or computer. It’s easy for you to play a video of each exercise, see the numbers of sets and repetitions, as well as written instructions. 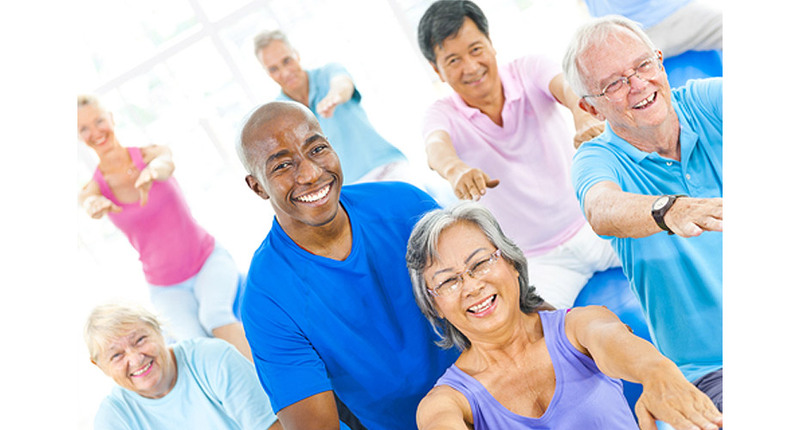 During your Physiotherapy Consultation your Physiotherapist will design a home exercise program for you. You can have a printed version of your exercises or receive a customized email. 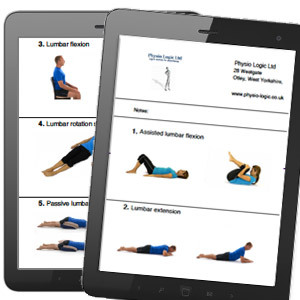 Alternatively by pressing the link on the ‘Login Here’ button below you can access your home exercise program online through entering your unique username and password given to you by your Physiotherapist. Pilates is a form of exercise designed to elicit and strengthen the deeper muscles of the body that literally ‘hold us in place’. It was Joseph Pilates (through working with ballet dancers in the 1960s) who realised, when these deep muscles lose their ability to work strongly and efficiently, imbalances occur within the musculoskeletal system. This muscle imbalance in turn causes the body to create poor patterns of movement and posture. He found that specific stabilising exercises enabled the muscles to strengthen uniformly, correcting poor posture, and restoring physical vitality. Physiotherapists are naturally placed to identify poor movement patterns and muscle imbalances through their line of work. They have integrated and developed traditional Pilates exercises to build on the retraining of these deep muscles or ‘dynamic core stabilisers’. Given their expert knowledge of the musculoskeletal system, and their experience of rehabilitation through exercise, they can teach the body’s muscular system to relearn and be reconditioned from its central core. This creates a perfect tool in the prevention and treatment of a range of postural, musculoskeletal and neurological conditions. Where Traditional Pilates is used as a form of fitness, Therapeutic Pilates can be an individually tailored treatment method used by physiotherapists to target the clinical problem of a patient and make it individual to their needs. Therapeutic Pilates targets the strength or ‘core stability’ of the deeper muscles which support the spine, making it an ideal rehabilitation tool for preventing further injury, and for general health and well being. Absolutely anyone! The wonderful thing about Pilates is that it can be tailored to the individual. Whether you are recovering from an injury or you would just like to improve your posture and general health or you are an athlete wishing to improve your performance in your chosen sport, Pilates is suitable for everyone. With regular practice Pilates changes the body to improve its underlying core strength, posture and enhance its flexibility and suppleness. Loss of flexibility and strength in certain muscle groups combined with poor underlying postural mechanics leads to potential injury problems or conditions developing later in life, both in the short or long term. Addressing these weaknesses early can enable effective exercise strategies to be introduced to prevent injuries or degenerative conditions developing in the future. Pilates trains muscle groups to correct underlying poor postural mechanics both at rest and during movement. 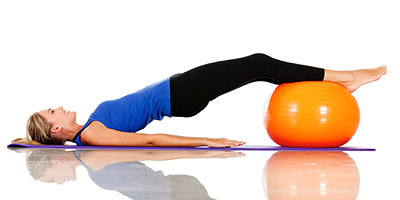 This helps your body move more efficiently and develops your natural underlying core support strength. It has been found to increase wellbeing through improved posture, balance and control. It can also help reduce stress and anxiety through learning efficient breathing and relaxation techniques. What does Therapeutic Pilates involve? At Physio Logic you can be assured that the exercises will be under the expert guidance of an experienced Chartered Physiotherapist formally trained to teach Pilates. The exercises will be performed safely, effectively and modified to an appropriate level for you. Each block is compromised of six one-hour classes running concurrently on a weekly basis. A course of Therapeutic Pilates is also a great way to benefit your rehabilitation if you have been attending the clinic for treatment. Using these low impact exercises to strengthen your core muscles will enhance your recovery, reduce the risk of further injuries, and provide a long-term approach to the management of your condition. Prior to attending, each participant is required to complete a Physio Logic Health Record Card. On receipt of payment and a completed Health Card Physio Logic Ltd will then confirm your booking and the corresponding course you will be attending. It wasn’t until Wendy, the owner and Principal of Physio Logic, used a Power Plate® herself that she realised the enormous benefits and value the vibration machine delivers. She was so impressed with the effects of the Power Plate® and the 30 years of scientific research supporting it she immediately knew the importance and necessity of incorporating a Power Plate® at the practice to assist patients’ rehabilitation. With its immediate strengthening and pain reducing benefits along with its ability to improve range of movement and co-ordination the Power Plate® is ideal for almost every patient. 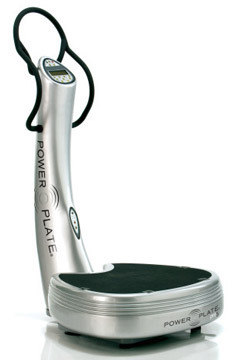 Whether it’s enhancing recovery from injury, assisting people wishing to return to the gym, improving current gym or sport performance, increasing general mobility and stability in the elder generations, or providing a valuable assistance in recovery from strokes, Power Plate® is a proven and important tool in the rehabilitation process. What is Power Plate® and how does it work? The Power Plate® vibrates extremely quickly (25 to 50 times per second) across very small distances of up to two to four millimetres so that balance is easily maintained as the micro movement causes muscles to react reflexively and automatically. The rapidly moving surface serves to stimulate reflexes to induce responses to keep safe and upright and allows muscles to produce more force on an unconscious level. This results in a dramatic improvement in strength and power, flexibility, balance, and tone. Stimulating the muscles and nerves this way results in more work being done by the body in a shorter period of time with far greater recruitment of the muscle fibres. If 30 Hertz (30 cycles per second) for 30 seconds is applied, the body’s muscles are expanding and contracting a total of 900 times in just half a minute. Over a 20 to 25 minute period the number of muscle contractions created equates to far more than the number performed over an ordinary gym session, serving to enhance performance in a far shorter duration of time. 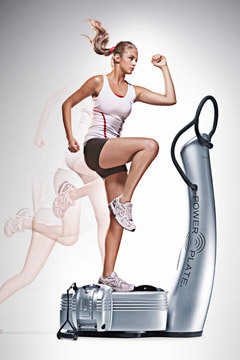 The Power Plate® works by vibrating in three-dimensions, or three planes: Up and down, side-to-side and front to back. 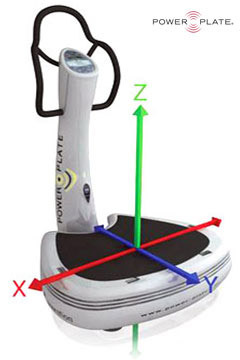 With many other Whole Body Vibration machines, only a side-to-side type of motion may be experienced, causing a wobble effect whereas the Power Plate® owns the patent to provide a 3-D workout which includes the up and down movement. It is this up and down movement that brings into effect the forces of gravity serving to increase the strength of the muscles without the use of weights. This is known as ‘tri-planar movement’; and is exactly what the human body is designed to do. When the Power Plate® equipment vibrates up and down muscle tone is improved. Left to right and front to back movements enhance balance and coordination. The net result is an improvement in strength and power. With regular use, results such as increased strength and flexibility, enhanced muscle definition and tone, and reduced cellulite and body fat will be seen and felt within the first few weeks. What are the benefits of Power Plate®? The technology behind the vibrating machine first helped Russian cosmonauts fight the effects of zero gravity, essentially loss of bone density and muscle strength, which even today independent studies continue to show, as well as demonstrating evidence of a multitude of other benefits. Just as Russian Cosmonauts first used accelerated training for rehabilitation, health care facilities, spas, national fitness chains, celebrities and professional sports teams, all use Power Plate® equipment for its rehabilitative effects. Will my Instructor be qualified and understand my medical problem? The Power Plate® Company, Performance Health Systems UK Ltd, strongly recommends clients only to use the machine with Power Plate® certified instructors. Since the introduction of the Power Plate® at Physio Logic six of the physiotherapists have attended Power Plate® courses and qualified as Power Plate® Instructors. Scientific and practical evidence indicates that there are numerous conditions where it is proven to be beneficial to integrate Power Plate® training into healthcare. At Physio Logic the Healthcare Professionals are ideally placed to ensure you are a suitable candidate for this form of training combining their in-depth medical knowledge of your injury or problem with their understanding of how the Power Plate® works. How is Power Plate® making a difference in Healthcare? Power Plate® is a Certified Medical Device, having received the Class II A MDD Certification in Europe. It is one of the very few fitness machines to have been given this certification and is included at some of the top medical and therapeutic centres in the world. Power Plate® machines are also useful for rehabilitation after trauma, strokes, and other debilitating illnesses. Therapists observe a decreased rate of deterioration in progressive neurological conditions as well as improvement in balance, gait, and core stability. Individuals suffering from conditions such as arthritis, Parkinson’s, multiple sclerosis, diabetes, osteoporosis and obesity, as well as many other conditions, benefit tremendously from physical activity. Unfortunately, sufferers of these conditions are often unable to exercise due to loss of muscle strength, co-ordination or balance, joint pain and poor circulation. Because using Power Plate® is so easy, the benefits of physical activity are now within reach for many of those not able to partake in conventional exercise such as walking, weight lifting or cycling. By stimulating the body’s natural ability to increase muscle strength, balance, blood circulation, lymph system drainage, endocrine system response and bone mineral density, individuals are now able to fight the effects of many debilitating diseases. Although there are no cures for many of the conditions, the Power Plate® machine can provide relief from many of the symptoms suffered and help improve their quality of life. In retirement communities, acceleration therapy plays an important role in the ability to stand and walk better. By improving balance and coordination, and promoting normal muscle mass, Power Plate® is making a difference in the quality of life of seniors. If working with weights is a struggle, as many people find, accelerated training through the use of the Power Plate® can be the perfect alternative, as weights do not need to be used during Plate sessions. Strength is still increased through the use of gravitational and vibration forces. 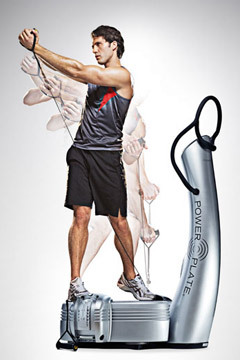 If time is at a premium, power plate® training can be the perfect alternative. Accelerated training reaps all the benefits of strength and flexibility training with ease, but in just a fraction of the time. Would I benefit from Power Plate®? If you feel any of these would be helpful to you then you would certainly benefit from having Power Plate® sessions. For further information please email us at: enquiries@physio-logic.co.uk or call the practice on 01943 850723 and a member of staff would be happy to help. What happens in my Power Plate® Sessions? Initial Session : To ensure you receive the maximum benefit from your Power Plate® sessions you will initially attend an extended one-hour session to incorporate a musculoskeletal screening process by one of the physiotherapists. Whilst we are happy for you to use the Power Plate® for specific benefits or purpose we would also like you to use the opportunity to utilise the Power Plate® session to combine this with addressing any underlying musculoskeletal weaknesses you may have that you may be unaware of. Screening assesses you natural range of joint movement and muscle length. Please see ‘Why do I need to be screened?’ below for further information on why this is so important. You will also be required to fill in a health questionnaire to ensure we have all the correct details regarding your medical condition and to assess your suitability for using the Power Plate®. Once we have completed your screening and assessment the physiotherapist will guide you through the process of using the Power Plate® and once you are familiar with it your rehabilitation session will begin. Follow-up Sessions: A Follow-up session is a booking for 30 minutes allowing at least 20-25 minutes of Power Plate® use. Due to the vibrational effects of the Power Plate® a training session on a Power Plate® machine provides the advantage of much shorter training durations for similar results achieved in much longer gym sessions. A 30-minute session is more than adequate to achieve all of the benefits the Power Plate® provides. Why are sessions of shorter duration compared to the gym? As the Power Plate® machine stimulates the body’s natural response to vibration these vibrations transmit waves of energy throughout the body, activating muscle contractions between 25 and 50 times per second, equating to between 1500 and 3000 contractions of the muscles in just one minute. Over 20 to 25 minutes the number of contractions created equates to far more than the number of contractions performed over an ordinary gym session, serving to enhance performance in a far shorter duration of time. Screening assesses your natural range of joint movement and muscle length. Loss of flexibility in certain muscle groups causes muscle imbalances to develop. This leads to potential injury problems or conditions developing later in life, both in the short or long term. Identifying these weaknesses early can enable effective treatment and exercise strategies to be introduced to prevent injuries or degenerative conditions developing in the future. A combination of exercises on the Power Plate can give both specific and general musculoskeletal benefits for your overall health. Screening has proven to be invaluable in identifying potential injuries, preventing them before they occur. It is a valuable tool used regularly in all forms and levels of sports for the early identification of injury and future health concerns. It is a tool not just for sports people but also for anyone wishing to benefit from addressing their musculoskeletal strengths and weaknesses. Ideally you should bring shorts, T-shirt and trainers to change into so that the physiotherapist can assess your joints and muscles easily throughout your session. Alternatively any loose, comfortable clothes and trainers are also suitable for exercising on the Power Plate. 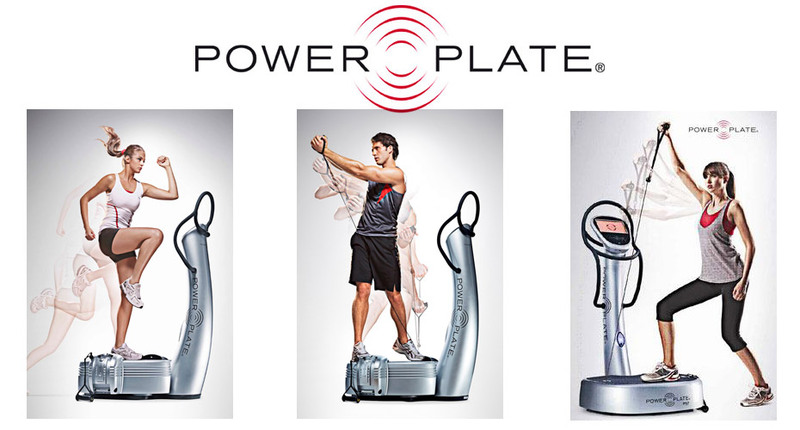 Is everyone suitable for Power Plate®? Should you not have any of the above conditions then you may be considered suitable for using the Power Plate®. Since its launch in 2000, quite literally hundreds of thousands of people around the world have used the Power Plate® machine, some for many years, with no adverse effects reported. Such widespread use over an extended period indicates that the Power Plate® machine is a safe and effective form of exercise. Of course, like any form of exercise, anyone considering using the Power Plate® machine for the first time should obtain medical clearance to exercise. If you already active and cleared for exercise, you are likely to be a good candidate for using the Power Plate®. There are also some pre-existing medical conditions, which may make the Power Plate® machine an unsuitable option. A Power Plate® certified trainer and your medical specialist would help you with further advice about this. Can I use a Power Plate® if I have a pacemaker? If your doctor or medical specialist has given you clearance to perform strength and cardiovascular training, or sport activities that absorb shock, such as skiing, horseback riding or biking, then you should be a good candidate for using the Power Plate® machine. However, we always recommend that you check with your doctor or medical specialist first because this person knows you and your medical history best. If your pacemaker is in your chest, we recommend that you perform exercises such as front planks and push ups around the other way, placing your hands and upper body on the floor, with your legs on the platform. If your pacemaker is in your abdomen, it should not be necessary to make any modifications to the usual recommended exercises. Please refer to the Power Plate FAQs. Are there any risks in using the Power Plate®? Since its launch in 2000, quite literally hundreds of thousands of people around the world have used the Power Plate® machine, some for many years, with no adverse effects reported. Such widespread use over an extended period indicates that the Power Plate® machine is a safe and effective form of exercise. Of course, like any form of exercise, anyone considering using the Power Plate® machine for the first time should obtain medical clearance to exercise. If you already active and cleared for exercise, you are likely to be a good candidate for this type of training. There are also some pre-existing medical conditions making the Power Plate machine an unsuitable option. A Power Plate® certified trainer and your medical professional will help you with further advice about this. Power Plate® advises all users to contact their physician or specialist before using the Power Plate® machine and recommend that they do not start training without first obtaining medical clearance to exercise. In all cases, if an individual is currently active, cleared for exercise, and already does any weight bearing exercise such as weight training or jogging they are a likely to be a good candidate for training on the Power Plate® machine. However every person should be examined on an individual basis by someone qualified to advise them. As with any form of exercise, if you feel faint, dizzy or ill while working out on the Power Plate® machine, you should cease the session immediately. Consult your doctor or specialist before restarting your training. Where did the Power Plate® originate? The technology was initially developed in the 1960s by the Soviets while preparing their cosmonauts for space. One of the problems encountered with space travel was muscle atrophy (severe muscle wasting) among astronauts. This, along with bone loss, typically occurs when astronauts spent extended time in a zero gravity environment. Through the use of a vibrational plate the Russians found a successful way to combat this; so successful, that their cosmonauts were able to withstand the negative effects of microgravity and to endure an average of 400 consecutive days in space, compared with only 130 days for American astronauts. The Soviets had discovered the secret of how to make gravity work for them. From there technology progressed and was eventually adapted for the training of Olympic athletes overseas, as well as training professional sports teams. Acceleration Training using the Power Plate has only recently made its way to the United States, and Europe. The research on Whole Body Vibrational Training WBVT, or Acceleration Training™ is nothing short of incredible. WBVT achieves what no other form of exercise can, in a very short period of time. You can find us listed on the Power Plate website as a trainer and plate locator for Otley. To enquire about our Power Plate services, please contact the Physio Logic reception.